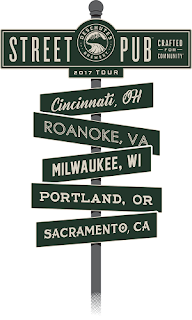 March 29, 2017 – Bend, Oregon – How do you take the biggest mobile block party – Deschutes Brewery’s Street Pub tour – and make it even better? By partnering with three of Oregon’s most beloved companies to bring new energy and activities to fans in five U.S. cities. This year, the brewery has added title partners that share its culture, sustainability and philanthropic goals: Hydro Flask, Humm Kombucha and KEEN Footwear. In each visited city, these three like-minded companies will join Deschutes to partner with nonprofits and raise funds to help them achieve their missions. Over the last two years, Deschutes’ Street Pub tours have raised more than $835,000. The 400-foot-long Street Pub will pour a huge selection of Deschutes Brewery beers, including its famed Mirror Pond Pale Ale, Black Butte Porter, Fresh Squeezed IPA as well as its highly coveted Reserve Series beers such as The Abyss. True to the brewery’s full pub experience, food will be a major part of the equation. 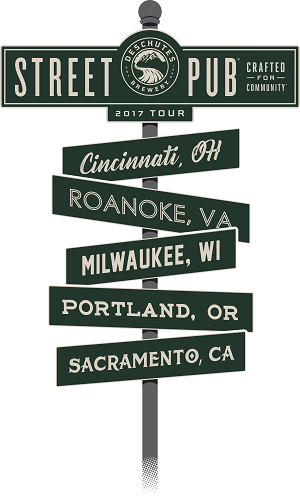 Deschutes’ corporate executive chef (Jeff Usinowicz) will team up with local chefs in each city to create some fantastic food pairings. Live local bands will round out a memorable experience in each city. Founded by Jamie Danek and Michelle Mitchell in 2009 as Kombucha Mama, Humm Kombucha rebranded in 2014 in anticipation of rapid expansion. From the company’s early days brewing in the founders’ kitchen through its expansion to a new full-scale brewery, Humm Kombucha has remained focused on core values of Optimism, Healthy Business, Partnership and Quality. Humm can be found in grocery stores, gas stations, convenience stores and restaurants in bottles and on tap in all 50 states -- and now in Sweden. Last year Humm unveiled Blue Wave, the Official Kombucha of the Seattle Seahawks. KEEN Inc. is a values-led, independently owned outdoor footwear brand from Portland, Oregon with a mission to responsibly create original and versatile products, improve lives, and inspire outside adventure. Founded in 2003, KEEN ignited a revolution in the footwear industry with the introduction of the Newport sandal, launching the concept of Hybrid footwear into the market and setting KEEN on a path of driving consistent product innovation that exists today. KEEN strives to live by its values, from its products to its actions, and by activating communities and individuals to protect and preserve the places where we work and play. KEEN passionately endeavors to live fulfilling lives, challenge the status quo, do good, give back, and inspire others. Learn more at www.keenfootwear.com.